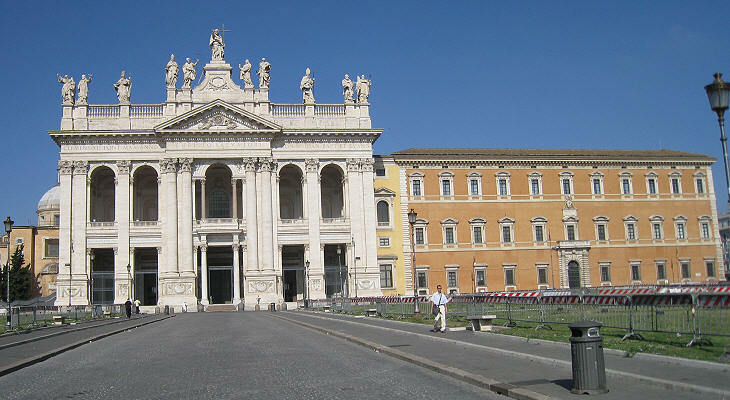 This view of S. Giovanni in Laterano was for Vasi a view over very modern buildings, or to be more precise over very recently modernized buildings, because the new façades of the basilica and of the adjoining palace were completed in 1735. It is interesting to note that the road which surrounded them was not paved. The view is taken from the green dot in the small 1748 map below. 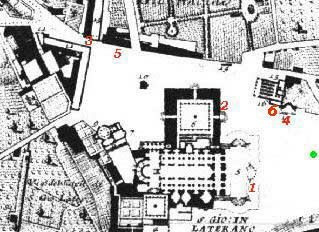 In the description below the plate Vasi made reference to: 1) Façade of the Basilica; 2) Palazzo Pontificio; 3) Women's ward of Ospedale di S. Giovanni in Laterano; 4) Triclinio; 5) Ruins of an aqueduct. 3) and 5) are covered in other pages. The small map shows also 6) Oratorio del SS. Sacramento. A large modern esplanade (a gathering point for political rallies) allows a good view of the two buildings, which have not been modified since Vasi's time. The etching shows the tip of the obelisk in front of the lateral façade of S. Giovanni), which however cannot be seen from the esplanade. After Pope Sixtus V (1585-90) had redesigned the lateral façade of S. Giovanni in Laterano, many popes considered replacing the old main façade with a new one, but only in 1732 Pope Clement XII took steps to provide the ancient basilica with an appropriate entrance. Twenty-three projects were reviewed by Accademia di S. Luca, the guild of the Roman artists; the choice fell to the project submitted by Alessandro Galilei, a young architect from Florence, who maybe was helped by the fact that the pope too was a Florentine. 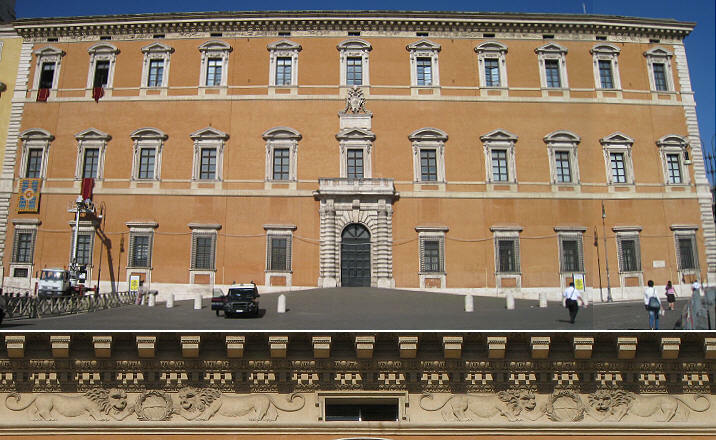 During the XIXth century the façade was regarded as an anticipation of Neoclassicism and it was highly praised. 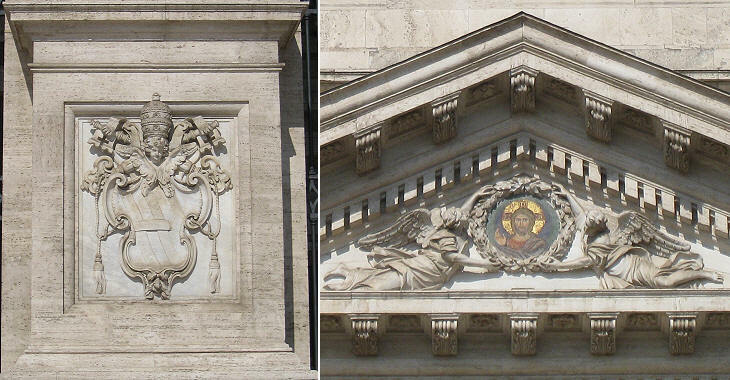 As a matter of fact Galilei combined elements of the Roman baroque tradition, but he placed them in a very neat frame, which gives the façade a classical appearance. The façade is crowned by fifteen gigantic statues. A large inscription dedicates the basilica to Jesus Christ Saviour, to St. John the Baptist and to St. John the Evangelist. Originally it was known as Basilica del Salvatore, but during the pontificate of St. Gregory the Great (590-604), it was dedicated also to the two Saints, owing to the construction of oratories named after them near the basilica. 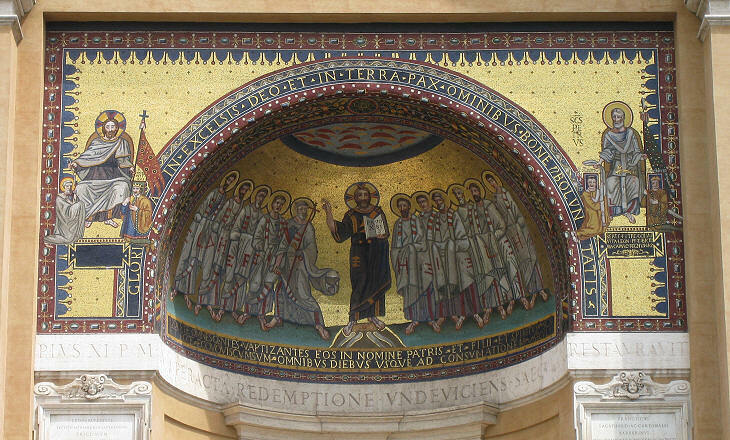 The original dedication was evident in the mosaic of Jacopo Torriti which decorated the old façade; its central part was relocated in the new one. 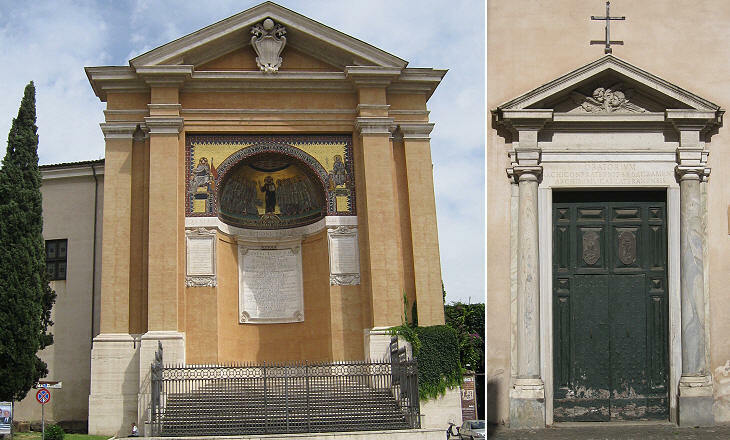 The name Lateran is due to the lost IIIrd century house of a certain Sextio Laterano, which gave its name to the neighbourhood. 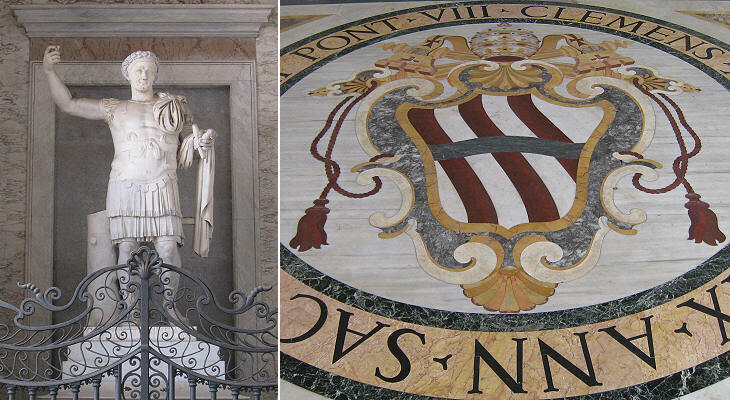 The main coat of arms of Pope Clement XII is inside the loggia, but other coats of arms can be seen in the portico (see below and the image used as background for this page) and at the base of the pillars.
" DOGMATE PAPALI DATUR AC SIMUL IMPERIALI QUOD SIM CUNCTARUM MATER CAPUT ECCLESIARUM ..."
The initial sentence states that "By papal decision and similarly by imperial decree I (the basilica/the Roman church) am the mother of all, the head of the Church". The inscription which was probably dictated by Pope Alexander III (1159-81) is related to the so-called Donation of Constantine, a forged document in which Emperor Constantine gave the pope supremacy over the other bishops and overall authority over the Western Roman Empire. The emperor is thought to have funded the construction of the first basilica on the site of the former barracks of the equites singulares (selected knights). These knights sided with Maxentius, Constantine's enemy and their barracks were confiscated. Pope Clement XII placed in the portico an ancient statue of the emperor: the arms and the lower part of the body are a Renaissance addition. 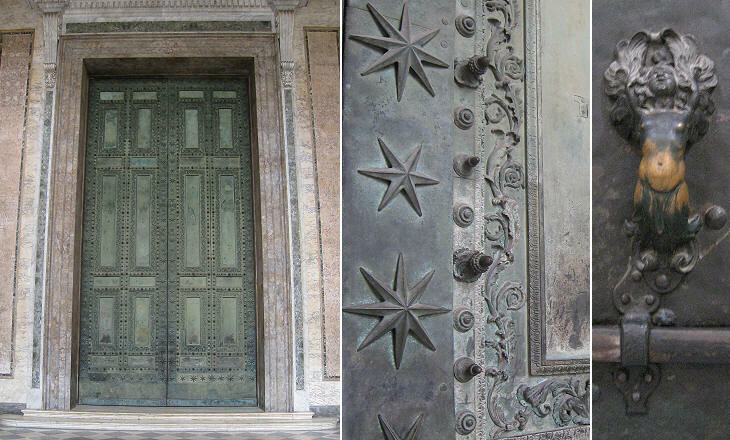 The portico contains another ancient work of art: the bronze doors from Curia, the hall where the Roman Senate had its meetings were used for the central entrance to the basilica. Because of their smaller size they were placed inside a bronze frame decorated with the heraldic symbols of Pope Alexander VII (1655-67). In 1646 Pope Innocent X entrusted Borromini with the renovation of the basilica interior, but he set some limits to Borromini's ingenuity as he wanted the floor and the ceiling of the main nave to be preserved. 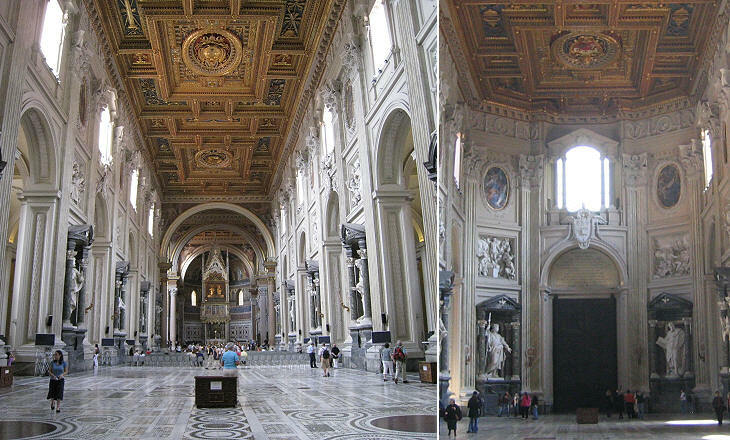 The floor went back to the time of Pope Martin V (1417-31), whereas the ceiling was a work by Flaminio Boulanger and showed the coats of arms of Pope Pius IV and Pope Pius V.
Additional limitations imposed by the Pope regarded the Gothic altar and the apse behind it. The contrast of styles between the main nave redesigned by Borromini and the previous elements is evident; the new decoration is based on white stuccoes and dark marbles, whereas the ceiling, the floor and the altar are full of colours. 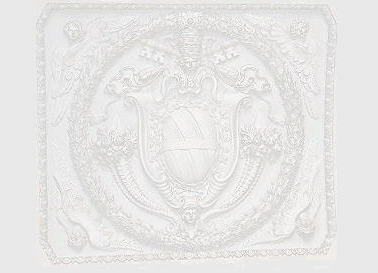 Borromini designed several gigantic coats of arms of Pope Innocent X: three of them were selected by Filippo Juvarra in his book on the coats of arms of the popes (to see them click here). In the main nave Borromini designed twelve gigantic niches which were decorated with precious marbles and columns: his project was that the best sculptors of Rome, including Gian Lorenzo Bernini, should fill them with statues of the Apostles. 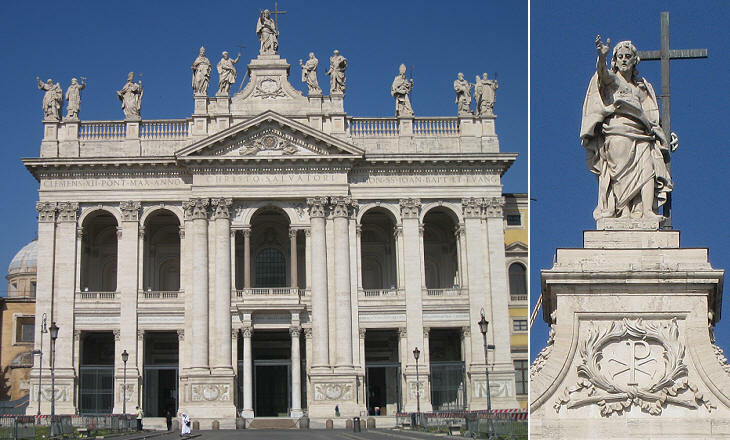 Pope Alexander VII, the successor of Pope Innocent X, was more interested in the design and decoration of Piazza S. Pietro, than in completing S. Giovanni in Laterano and the niches remained empty for sixty years. The statues were placed in the niches between 1706 and 1718. .
Borromini was free to redesign the four smaller naves: he made use of stucco angels and he emphasized the nave perspective by lowering the final arch. 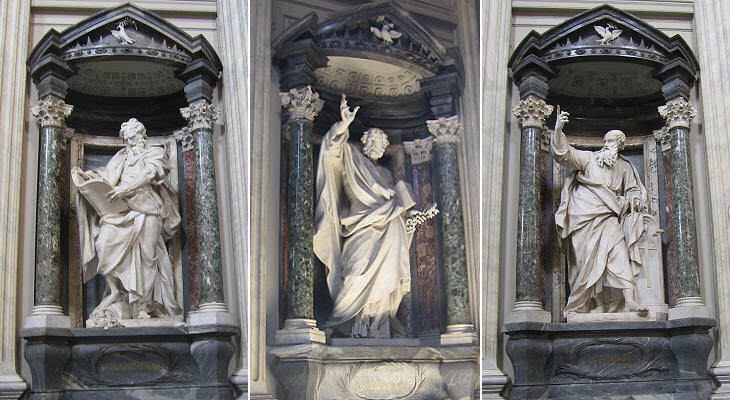 He also designed some funerary monuments for these naves where he showed his talent for combining curved lines; they are similar to those he designed for Cappella dei Re Magi in Collegio di Propaganda Fide. The floor of the lateral naves is paved with tiles creating an illusion of three-dimensional boxes. In other pages of this website you can see the organ of the basilica, learn about the gruesome warning of the sweating stone or see some interesting inscriptions. 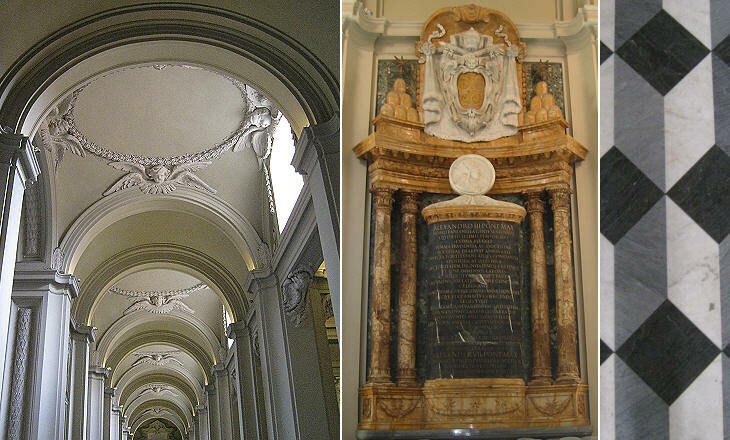 In restoring Palazzo Laterano Pope Clement XII paid tribute to Pope Sixtus V, by adopting a decoration very close to that existing on the other sides of the building. The lions placed on this side, however do not hold pears, but frame Pope Clement's coat of arms. 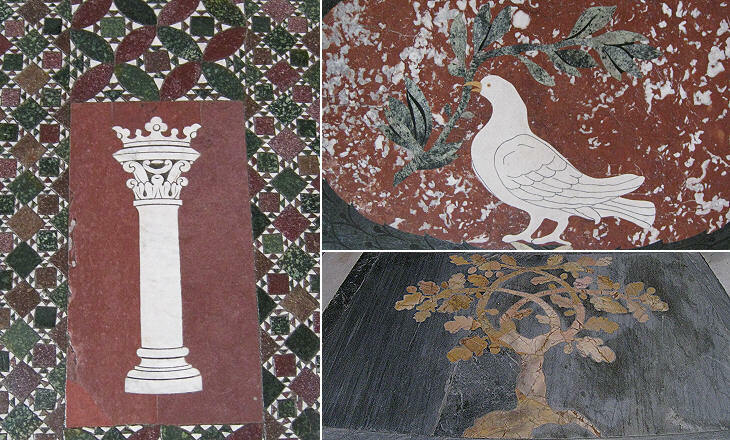 The large Tribune adjoining Scala Santa was built in 1743 by Ferdinando Fuga for Pope Benedict XIV and decorated with mosaics which are copies of those in the banqueting hall (Triclinio) built by Pope Leo III in the old Lateran Palace. For more on this and other mosaics click here or read Mark Twain's comments. Between the Tribune and Scala Santa there is Oratorio del SS. Sacramento, a chapel which belonged to a brotherhood having the objective of assisting the dying. The chapel was built in the second half of the XVIIth century. Nell'entrare da questa parte (dall'ingresso laterale) si vede in primo luogo l’altare papale fatto da Urbano V. con marmi alla dorica, sopra del quale fra le molte reliquie collocò le teste de' ss. Apostoli Pietro e Paolo, che si mostrano in diversi tempi dell'anno. Sotto l’altare si custodisce quello, sopra di cui celebrò s. Pietro, e anche i primi santi Pontefici fino a s. Silvestro. Nella tribuna si vedono i mosaici fatti da Niccolò IV. 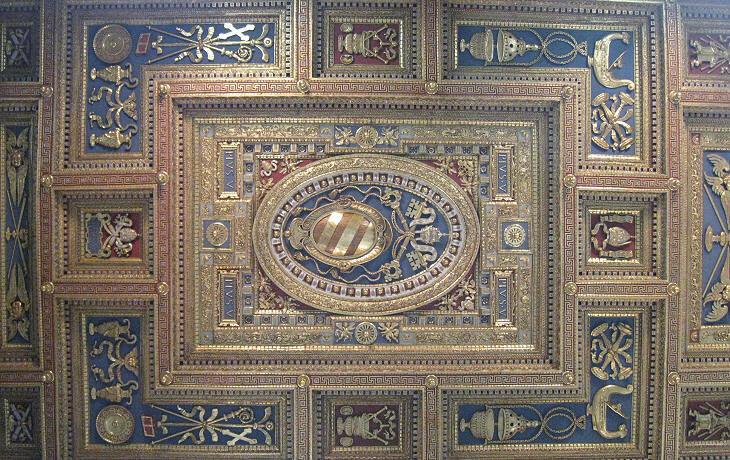 il quale fece ancora il gran soffitto dorato; le pitture a fresco, e i lavori di marmi furono fatti da Clemente VIII. avendovi dipinto il Baglioni, il Nebbia, il Pomaranci, ed il Nogari; fece il medesimo Pontefice l'altare del ss. 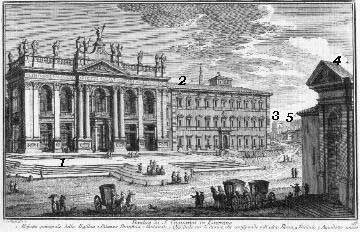 Sagramento ornato di metalli e pietre preziose, ed un gran bassorilievo di argento massiccio rappresentante la Cena del Signore, fatta da Curzio Vanni; le 4. maravigliose colonne di metallo dorato furono, secondo alcuni, fatte de' rostri delle navi Cartaginesi vinti da' Romani, e poste nel tempio di Giove Capitolino; altri dicono essere state portate da Vespasiano con altre spoglie trionfali dalla Giudea, e ora sono piene di terra santa portata in Roma da Gerusalemme; gli angioli di metallo dorato, e le statue di marmo sono di varj autori, ed il Padre Eterno dipinto nel frontespizio di metallo è opera del Cav. d'Arpino. Si vede nel nuovo portico la Porta santa che si apre l'anno del Giubbileo, e una statua antica dell'Imperarore Costantino fondatore della Basilica, trovata nelle sue Terme a monte cavallo; i bassirilievi, che sono sopra le porte, sono sculture moderne.